My drinks are hiding in that bag! This summer has been one of the hottest yet, so I wanted to share two amazing cocktail recipes that will be sure to cool you down during the remaining days of summer. If you’re enjoying a hot day at the beach or spending a warm evening poolside, you’ll be toasting to summer properly with these refreshing sips! So first up we have the Malibu Sunset Cocktail made with MALIBU® Caribbean Rum With Coconut Liqueur. It's so easy to make and offers a beautiful blend of coconut rum, pineapple, and sweet grenadine. This gorgeous drink definitely says Caribbean sunset to me. I immediately transport to a hammock on a beach watching a sunset as I sip these! Malibu just screams summer and is my official summer sip-of-choice. Plus they are just so pretty with the layering technique!! And what fashionista doesn't love a stylish cocktail in hand?! Place 3-4 ice cubes in the bottom of a glass. I stuck 2 cherries and a pineapple chunk on a toothpick for a garnish. Enjoy your drinks immediately. So now we have the second cocktail featuring JAMESON® Irish Whiskey I am a total whiskey girl (whether its drank neat, on the rocks, in a cocktail or with a beer Jameson always something that can bring friends together) and I like to have options for my friends at my pool parties and I am in love with the taste of classic whiskey sours. A whiskey sour is yours for the making year-round. It's refreshing enough to keep up with a spritz during these hot summer months, and so appropriate during the colder seasons of the year. Even if you're not a whiskey fan (which breaks my heart), you might still find yourself swooning over a well-crafted whiskey sour. It's that good! If you have had a whiskey sour at your neighborhood sports bar well, you I would probably guess you did not like the whiskey sour. The secret is using fresh ingredients. It's such an easy cocktail to make at home, and perfect for entertaining guests. There's nothing better than hearing that ooh! from your guest when you hand them a coupe glass filled with whiskey sour goodness. To get started, you'll need some bourbon, lemon juice, simple syrup, and one small egg (optional, but more on this in a bit). Build the cocktail. Place the Jameson, lemon juice, simple syrup, and egg white in a cocktail shaker. Do not add ice yet. Shake again with ice. Add ice, seal again, and shake for 7 to 10 seconds more to chill. Strain the cocktail. Fit a Hawthorne strainer over the top of the shaker and pour the cocktail through a fine-mesh strainer into a coupe glass. This is referred to as a "double strain" and this method is used to catch any ice shards or pulp from the fresh-squeezed lemon juice. Garnish and serve. Garnish with a speared maraschino cherry. Bartenders use egg whites in cocktails, like the whiskey sour, to give it a rich, creamy texture along with a smooth head of foam. To stay on the idea of fresh ingredients, use organic eggs (or pasteurized if you're still on the fence). If you're curious about it altering the flavor, just know that egg white is flavorless. It also helps to reduce the acidity from the citrus and bind the flavors together. It enhances the presentation of your whiskey sour, too. Remember, we're not settling for anything less than an ooh! from you and from your guest. If you still feel like shaking up your cocktail with raw egg white is just too much to stomach, then feel free to leave it out! I personally love it. Lin hates it so I make both versions! 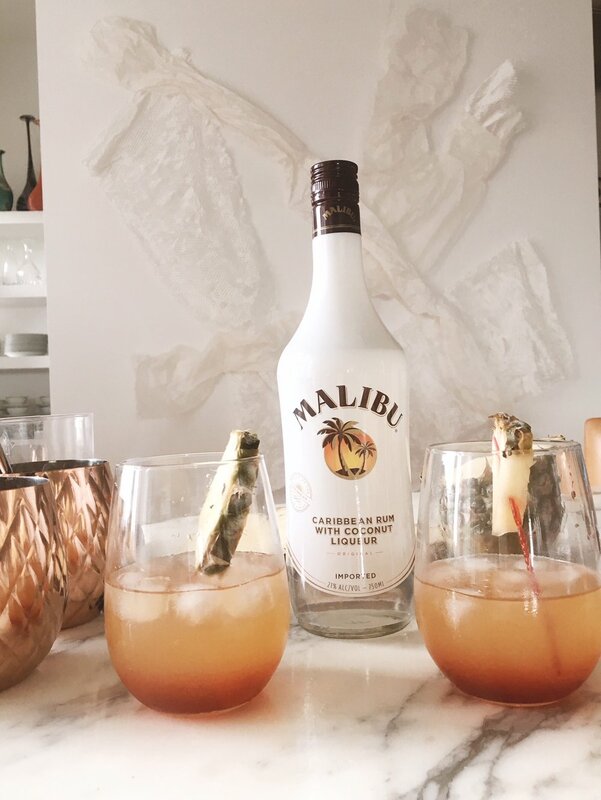 Cannot wait to see you create some cocktails using MALIBU® Caribbean Rum With Coconut Liqueur and JAMESON® Irish Whiskey as we enjoy the last week weeks of summer! Please share your recipes in the comments below! And if you need more inspo aside from my blog check out these amazing recipes for your Last Chance Backyard Bash! Find great #CelebratorySips inspiration now! Sharing some deals below because I love you! Offer: Save $2.00 NOW through August 18th on the purchase of any ONE (1) 750ml bottle of JAMESON® IRISH WHISKEY or MALIBU®. Offer: Save $3.00 BY MAIL through the 15th on the purchase of any ONE (1) 750ml bottle of JAMESON® IRISH WHISKEY or MALIBU®.